Iveco received the first prize in the category of Excellence in the System of Continuous Improvement in the industrial sector awarded by the Kaizen Institute, the original lean management consultancy founded by Masaaki Imai. The prize was awarded to Iveco’s Madrid manufacturing plant for the application of the World Class Manufacturing methodology, an integrated system that aims at customer satisfaction through optimization of the production and logistics processes, improve product quality and eliminate errors, inefficiencies, waste and accidents. The awards ceremony, held on November 21 at the Palacio de Cibeles in Madrid (Spain), was attended by the management team of Iveco’s Madrid plant, led by the Plant Manager Manuel Mansilla, who accepted the prize on behalf of Iveco. Also present was Jaime Revilla, Managing Director of Iveco Spain, who took part in a round table discussion about the role of continuous improvement in cost reduction. 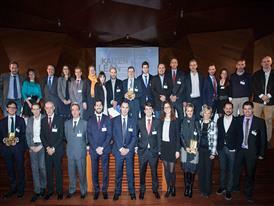 With this award, the Kaizen Institute recognised the results achieved by Iveco’s Madrid plant in continuous improvement. Two consecutive years without accidents; the involvement of all the plant’s employees, who contributed on average 27 suggestions a year each; the 100% customer service level in delivering orders on time; 7% annual savings in the plant’s costs are the achievements that particularly stood out. Iveco’s Madrid plant is not only the most efficient of CNH Industrial’s 64 manufacturing facilities: it is a quality reference in its sector. The site is exclusively dedicated to producing the new generation Stralis, TCO2 Champion, in its XP and NP versions, and the Trakker for the quarry and construction industry. It employs more than 2,500 people, of which 21% are women – the highest persentage in the sector in Spain. The plant drives off the line a unit every 7 minutes. Around 90% of the facility’s production is exported, mainly in Europe, but also to Africa, Asia and South America.